Americans pay somebody who makes them laugh millions and they pay those who die for them lip service. As much as i respect our men in uniform, I don't really have an issue with this. When in American history did the press highlight deceased soldiers? It is too depressing to watch day and day out and that is sad to say but the truth. More importantly it comes down to ratings, the owner of this blog should know that. Ratings, money, viewership make this go round and round. Without the flavor of the month; Sheen, Lohan, Rihana, and Paris Hilton there would nothing to talk about in Hollywood. Damn, at lunch at work I'd rather look at TMZ, then a site who lists the recent deaths of soldiers. Who wouldn't? Again I respect our men in uniform and this is an unbiased view. thank you, verterans, families, and especially to the fallen. there are no words to express what you have sacrificed for the rest of us. Sheen is a loser. These guys are the real heroes. Wow. Just wow... Give someone a couple words, and the conspiritists, crazies, and anti Americans come crawling out. What scares me the most? That most of them are probably young. And those people that spend each day with the deaths in asscrackistan on our minds? No were not always depressed... Were loving and loved by someone over there, and each soldier, marine, sea man and airman is a family member. For the comment made about mindless killing robots... I've met more compassion in the military world, more strength and lessons than ever in the civilian world. Whether for a paycheck or not, a death is a death. They do not choose who where or when. Baby killers??? What is this, 'nam? War is not innocent, everyone is at a loss. But even when your team is losing you support it. When my husband did his tour, he was stunned at the happiness he was met by there. To have them there. Because it WASN'T good before. So for the anti Americans, I do ignore you because I know there are non Americans out there that do not hate us. And to point out, Americans can't really be the claimed "elite" it's on our TVs that our education system is not up to par with the rest of the world. You're telling me nothing new. "Lets all get out of Vietnam"
then I heard them say "This one's dead"
First I would like to express my condolence's for the loss of your son. Americans has to be posted on facebook in order for this nation to be aware of their sacrife. I remember the day when there were real journalists working to bring out the truth and let Americans know what is really happening in the world. Now they are all just corporate talking heads who spout out whatever they think will attract ratings. Who care's about Sheen, or anyone of these losers in Hollywood? It says something about America that a drug addict gets 1.8 million per week, a soldier dies for $1200 per month. I GUESS THE CENSOR DIDNT LIKE MY LAST POST ABOUT – THE D.P.S.S. OFFICE C.P.S. DEPT – USEING – SERVICE RECORDS AGAINST VETERAN PARENTS IN "CLASSIFIED" NON DISCLOSURE – -PSYICIATRIC PHSYCOLOGICAL EVALUATIONS – TO DETERMINE WEATHER WAR TIME RELATED EVENTS IN THE SERVICE TO YOUR COUNTRY CAN COUNT AGAINST YOU IF YOU HAVE AN OPEN CASE AGAINST YOU -AND CANT SPECK ABOUT YOUR SERVICE – IT WAS DONE ALLREADY IN CALIFORNIA – JUST CHECK THE CASE OF STSGT JOSEPH ALBERT LAVERTY JR – DEORATED VIET NAM VET 7TH GROUP GREEN BERRETS PURPLE HERATS AND PRESIDENTENTIAL UNIT CITATIONS -INCLUDED – YEP HE ISNT THE BEST DAD IN THE WORLD BUT IVE SEEN NOTHING SAYING HES AS BAD AS THEY CRUSIFIED HIM TO BE – AND AGAIN THEY USED HIS OWN COMBATEEXPERIENCE AGAINST HIM -TEN YEARS RUNNING NOW – THE D.A HAS MESSED WITH HIM SUPPORTING HIMSELF IN CHILD SUPPORT AND -ALSO HE HAS BEEN DECLARED 100 PERCENT DOISABLED BY SSDI AND ALSO HES DISABLED THROUGH THE V.A. – MY ADVICE TRY HELPING OUR VETERANS INSTEAD OF HURTING THEM AND THERE FAMILYS WHEN THEY HAVE PROBLEMS AND NNED HELP – IM A VET AND HAVE HELPED MY BROTHER IN ARMS FOR A DECADE – – SO YEP – I AM ASHAMED OF WHAT CALIFORNIAS SYSTEMS DO TO OUR VETERANS AND ALSO HOMELESS VETERANS . – IM ANGRY WITH REASON- -ANY WAYS – TO OUR FALLEN HEROS " – MAY YOU REST IN PEACE AND THANK YOU YOU AND YOUR FAMILYS . GOD BLESS YOU AND GOD KEEP YOU . PLEASE check out "Support Adam M. Malson Elementary" on Facebook. It is an initiative to rename a school in my hometown after a Soldier who was killed by a suicide bomber while saving Iraqi civilians from a burning bus in Baghdad in 2005. This is a way to honor a local hero that died protecting the newly granted freedom of people being hunted by their countrymen, because of sectarian differences. This Soldier died helping innocent victims, something that didn't make the news. Anyone who has the time to read these comments, please take another minute to visit the fb page!! Thank you for your support! I couldnt care les about the empire, or its hired goons and mercs. Keep draining our treasure and think that you are making a difference. Your family and your son have made the ultimate sacrifice for our freedom in America and most people want to know what going on with Charlie Sheen and Lindsay Lohan. I refuse to read or watch anything more on these pathetic people in Hollywood. If you want to make a difference in the the world, you don't need to have tiger blood, you just need to be a proud American like your son and be willing to give your life for our freedoms we live with everyday. The names of these American soldiers are etched upon my heart. I look at their faces and wonder about what else they could have contributed to our world besides dying for their country so young. It's truly appreciated, and a considerable loss. All fine men and women. All of them! As a mother of Two U.S. Army Soldiers I SEND MY DEEPEST CONDOLENCES TO ALL THE FAMILIES who lost loved ones in Iraq and Afghanistan. To honor those who sacrificed their lives for this Country would be the greatest memorial and honor bestowed on our Soldiers. To cover a person like Charlie Sheen who thrives on Drama is a slap in the face and is a disgrace to the memory of our soldiers. Shame on you Charlie. Check in some where and get help. Some don't understand but this is capitalism gone to the extreme. Talking about Charlie Sheen saves news networks money. And the news network bosses support the wars more than the public, so they don't want reports on dying soldiers. It's a money game. Charlie Sheen makes them money because they have less to report on, then, if they talk about him a lot. That's what America has become. Why? Because the networks hate our democracy and our need for decent news to be informed citizens. As a disabled veteran, it is a shame that the political influence would rather focus on over paid actors and how they can spend millions of dollars being above the law while our family members give th eultimate sacrafice. I feel that our country and the media would rather everyone forget about the real world and the conflicts we are ingauged in, both known and the secret..
Our soldiers are engaged in a noble cause over there to help the afghan people fight against tyranny. However, awful the situation is for the afghans, I must reject the mission. It is not worth the lives of our troops. Please bring them home. RIP to those heroes. wow. very powerful article. i would like to see CNN step up and stop the unnessary coverage of Sheen and put more articles like this in their coverage. it helps me appreciate life, my wife and my kids all the more. sorry for your loss Mr. Wilfahrt. sounds like you had a great kid. I thank you Mr Wilfahrt for your son's bravery, and sacrifice, please ignore the idiot who's posting all of the bs above, true Americans are proud of people like you and your son, the rest of them, should travel back over the border. God Bless our Troops! My heart and prayers goes out to the families of these young men. So glad someone made notice of this celebrities get too much attention sometimes. I am glad to say I was a part of the Facebook posting and I a m also glad this has gotten the coverage. I have to admit that I watch some gossip every now and then on shows like E!. I don't like turning on the news( local or nation wide) and seeing what some over paid, drug using actor is doing. This is the first time in a long time that I've visited this site and didn't read about someone who isn't on television. We need more of the untold stories of the men and women who are giving up there lives for us! I wept when I read the story of Andrew. It is totally ridiculous that something as shallow as the "Sheen" stories should get so much air time when there are stories of people making a genuine difference which are literally buried. The media talk about "another sheen story" and yet they have to take responsibility for fueling an interest in shallow news stories. I feel sorry for Sheen, but as a teacher it's the story of Andrew and his legacy I'll share with my high school students. To Andrew's family, thank you. Thank you. Thank you. Thank you Mr Drash. I'm glad someone at CNN sees that there's something much much more important to bring to our attention than the rantings of yet another worthless celebrity. Thank you for writing on this. We as a country should do more to honor these men, these are the heros I want my son looking up to. we must never for get that the Value of Life, and living will always outweigh the waste of one! I'd rather hear about Sheen, at least he's not murdering women and children in an illegal war. god bless all of those who have sacrificied their lives for our way of life and to those that are will in the future preserving it.freedom comes at a very high cost. I know it's good to be able to point fingers. I do it all the time myself. But, I think it's important to recognize the the media, in part, reports what we are interested in as a whole. War is not a popular topic to the majority. As a country we seek entertainment and maybe comfort in the pains of public figures. Heck, I laugh at the Sheen jokes. And that is part of the problem, yep I admit I'm at fault. It does not lessen the loss of anyone, soldier or not. But, I appologise for my role in the general insincitivity and complacent mindframe of Americans. I enjoy Charlie Sheen's antics, although his is a tragic case. I don't think it is reasonable or responsible to compare his popularity with that of soldiers dying in Afghanistan. The author of his piece does a disservice to the public by "stirring the pot" on a very touchy subject. Of course we love our troops. Of course we support them, regardless of our personal views on the war(s). I, for one, support the decisions made by our Commanders and believe that we are accomplishing goals in these foreign lands. Better we fight the enemy of our country "over there" than experience IEDs and bombs in our own streets and neighborhoods. Islam is a peaceful religion that has been corrupted by evil men, with ulterior purposes. The Taliban must be eradicated....and the cost will be high. Thank God we have such brave Americans that step forward and undertake these dangerous missions. God Bless The USA. Look, people are still complaining about the type of recognition the soldiers get while all these celebs get a lot more attention. It all has to do with the liberals owning the media and not giving all the stations the freedom to report what they want. If they report something that is helpful to the well-being of the country, then it probably won't be aired. On the flip-side, if they report something that is completely mindless and has no efect, then they will allow it to be aired. It is all politics and we have no control over it. What we do have control over is the fact that we have people like freelance reporters and some good people in society just like the person who started the facebook post. Brian Tabada was my girlfriend's ex-boyfriend. They dated for a year or so before we got together. She misses him dearly and I don't blame her. I didn't get the honor to know him, but I wish I did. All these men truly are heroes. Just as all the men and women that are serving our country. I want to thank all of you for serving our country and giving us the freedom that we have today. Frankly, no one wants to hear about a gay soldier, im in the army & they shouldn't b aloud. Who cares, he's dead. A less gay in this world that anyone can worry about. Good ridden. I plan on boycotting all Sheen TV shows and movies. We can choose the people we support and those we don't. I care much more about our servicemen and women than any celebrity. Great blog post! Awesome recognition of the real heros! and "#%*&" Charlie Sheen! He's such a tool. Sheesh, death, death, death. Dead soldiers, here, dead soldiers there. So much coverage on this, I think they're trying to turn us against the war. They're bias. May God bless all our servicemen and women all over the US and keep them safe. While I don't anyone stationed outside of the US personally, I certainly think of you all and your families here at home often. What you do is not forgotten. You are trying your best to put a good face to America and we appreciate. Its sad that the press covers politics more than you, and certainly far sadder that the coverage of celebrities is so widespread. Perhaps if the press focused on the good stories of the good people in America that sacrifice time, effort, money and love for those in need, to the stories of the heroic, and stories of good people giving their all, the world would have a different opinion of Americans. Priorities are not where they should be when Sheen or other celebrities are googled more than our own homegrown heroes. If even 1 of 10 Americans boycotted all media coverage about celebrities and wrote a letter to someone overseas as opposed to watching TV, perhaps it would have an effect. I have five big fingers I would love to introduce to your hideous face via my fist. So does this prove that social media is more realistic than the news? OH MY GOD Latinos dying for this country??? That is something Repukkkes will never understand! This brought a tear to my eye. From brother to brother, R.I.P. Thank God we have true Hero's in America who are fighting for us all. These are our Hero's and we should all be their fans. I look at Sheen as a form of entrainment but I depend on our troops !! Sheen will be out of the news soon but our troops will always be in the news and rightfully so !! GO Navy !! So, drop the constant Charlie Sheen posts, CNN. You're as guilty as the rest of the media, probably more than most. Instead, Have a daily feature about soldiers if you like. Whats the problem? Be it actors or famous athelets, they feel they are more important than everyone else. But we also enable this through our obsession with them as echoed by the rediculous media coverage. It makes a mockery of this country and all the good men and women who serve it via the military and all other forms of service. If only we all could muster the strength and reject the falseness of those who put themselves so high above their fellow man and really focus on what and who are important. My greatest respect and sympathy for those who serve and for the families who have lost their loved ones. In the meantime, I am turning off my TV. I support our troops 100% but what a lot of you are forgetting is that the media is a business. A business's goal is to make the greatest profit that they can. Yes it is sad that troops die, but few people would sit and watch the news if they continually reported on each causality. I agree that the troops who give the greatest sacrifice should get air time, but from a business prospective it wouldn't make much sense to report on each causality continuously throughout the day. People wouldn't watch not because they don't respect our troops but because it is truly saddening. Whereas, Sheen's dilemma is almost comical. Again I support our troops and hate seeing them lose their lives, but media is a business and they are going to follow what people will watch continuously throughout the day. Most of you probably hate seeing Sheen on TV, understandable, but obviously there are plenty of people out there that are watching it. Will we ever stop fighting here on Planet Earth? Thanks to all US amry servicemen! God bless them. We need to shun Hollywood coverages cause they are not serving our country but only serving themselves! am really sorry about these soldiers , but they were there for ? killing others and they were killed,. God bless those soldiers and their families. Thank you for writing this article and remembering these fallen soldiers. 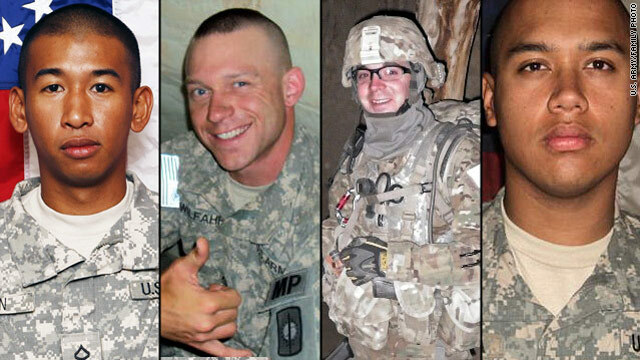 Each of these men has made the ultimate sacrifice for our safety and freedom and have been honored for their sacrifice. Thank you to their families for all their sacrifices and supporting their sons in their decision to join the army. As an army wife I understand your sacrifice and am sorry for your loss. All I can say is it is about time. The likes of Charlie Sheen and Lindsay Lohan, well lets just say their parents should have gone to sleep that night instead. It is time for the press to spend less time focusing on celebrities and more on the strength and diversity of the real people of this country. Bye Salerno. Time to get off the computer and do your home work. Time to grow up too. Finally – someone understands what is important and what is not. American society has diminished greatly since Actors and sports figures became the most important thing in our lives. All so called "news media" should be ashamed that social media provides more news than they do. God bless our men and woman giving their life during their overseas mission. simple question: what has this evil twit charlie done for anyone but his own pathetic self? Those serving, those who served, and those who made a career of military service have my first priority of attention. A once great president once stated "ask not what your country can do for you but what can you do for your country. Hmmm..what have the "sheens" done for America (easy answer nothing). this twit does not even deserve the opportunity to lick the heel of any boot of any serviceman/woman faithfully serving America. The fact that media pays attention to this twisted indivdual and airing his stupidity is just amazing to me. CNN, you are just as guilty as all other media outlets. Some days I wonder if I'm reading TMZ.com or CNN.com. Shame on all of you of giving that dope all this attention. God Bless our Troops! They are the ones that are WINNING!! Salerno you need to eat a bullet! Finally, a great story by CNN (when they're not competing with Rolling Stone to get senior military officers fired). It seems that this reporter has done a great job identifying the problem, now the hard part is going about fixing it. I don't have a lot of faith in your editors however, and think it's a matter of time before this story is replaced with one about the latest thing Lady GaGa's dress is made out of. So CNN has figured out what the rest of us already knew. Its reporting is terrible. Charelie Sheen having a meltdown is funnier than those four dudes dying. I'm just wondering why the terrorist attack in Germany, taking the lives of two American Airmen, disappeared out of the news in less than 24 hours. I heard we would have lost more lives, but the shooter's gun jammed. This was a TERRORIST ATTACK on a bus regularly used by US Soldiers. CNN....how about some coverage of this!!! Finally, Americans are seeing the real things that are important. I don't care about Charlie Sheen orLohan.. I care that young men and women are dying for my freedom.. I care that people are out of work, can't keep their homes, can't feed their families, pay their bills. I care that gas is $4.00 a gallon.. I care that collective bargaining is being taken away. These are important matters. Wake up America. If we turn our backs on the things that are not important, than maybe, just maybe our country will begin to see the light. Service and sacrifice is something civilians will never understand, no matter how many books on the military they read. We can't expect them to give the military the real credit they deserve so it's no surprise at the media's bad taste is "news coverage". As for myself, I am fed up with constant news coverage of Sheen, Lohan and other celebs. Who are these people? They are NOBODY's as far as I am concerned. I just can't imagine why a major news network, would think seeing Sheen all doped up, is even for one minute, news. I have switched channels to try and find someone that reports the days events, that are truly news. All is can say is Sheen, Lohan and others are not completly stupid, look at all the FREE publicity they are getting. A Soldier in Ga. needs prayers tonight. Sgt. Phillip Casey lost his leg yesterday in Afghanistan during patrol when a IED went off. He has a fiance and a small daughter. Everyone lets not just keep him and his family in mind, but every other Soldier who is out there and on foreign soil. "America is not at war. The military is at war, America is at the mall." Thank you is not even enough. They made the ultimate sacrifice. All of you were willing to send these young men to die, but now you'd rather pay attention to what stupid BS Sheen is up to, that is what is wrong with your country. The coverage of Charlie Sheen is f-ing stupid, but so is the idiotic idea that the coverage somehow takes away from coverage of US soldiers killed in Afghanistan. It's all f-ing stupid. Why are they covering that idiot Charlie Sheen anyway he's a nobody. Our troops are dying daily over there they should get recognition. My condolences to the families... I hear your story. My sincere sympathy to all the families of these brave men. Welcome to the mainstream media! If the pols aren't talking about it. do you really think our cowardly media will cover it?? Especially with a Dem in the White House there's harmony on the war, so who cares about the lives on both side that are sacrificed. Hopefully one day the American people will rise up like their brave counterparts in Egypt (and in Wisconsin). I am deeply sorry for your loss. I do not know how you feel, but again I am very sorry. I don't know your son but I am proud for what he stood up for. He really is a Hero and I think a lot of other people will agree. So from one soldier to another HOOAH! He really is a great person. Better idea, bring all our troops home and end this occupation which is not accomplishing anything! condolences to all your families and thank you for your sacrifices. So many brave young men. I'm tired of hearing about spoiled, self-centered brats who never sacrificed for anyone. Just to remind everyone, we were attacked and we have a fine tradition of fighting our battle on other peoples soil. Ummmmmmm...HELLO?! Literally right below this cover story on the same page says " Sheen sues Warner brothers, Chuck Lorre." What a joke. Make up your mind, sellouts. No sympathy for the soldiers, especially the marine jocks; they've been the willing instruments of a toally flawed perpetual war which isn't working. Amazing how afterr ten years of war anyone could still support it...whoever does must be in total isolation or suffer from complete tunnel vision or is simply venal. All this crap about fighting for freedom and democracy is regurgitated rhetoric. Right- NO SYMPATY FOR THE SOLDIERS AS THEY ARE KILLERS. Don't be surprised that soldiers are dead and money talks. The same people who do not want you to praise money support war so we can have people like Charlie Sheen. Bring all soldiers home and turn your t.v. off. All of this can stop.